A warming and comforting salad that even people that don’t really love salads will enjoy. 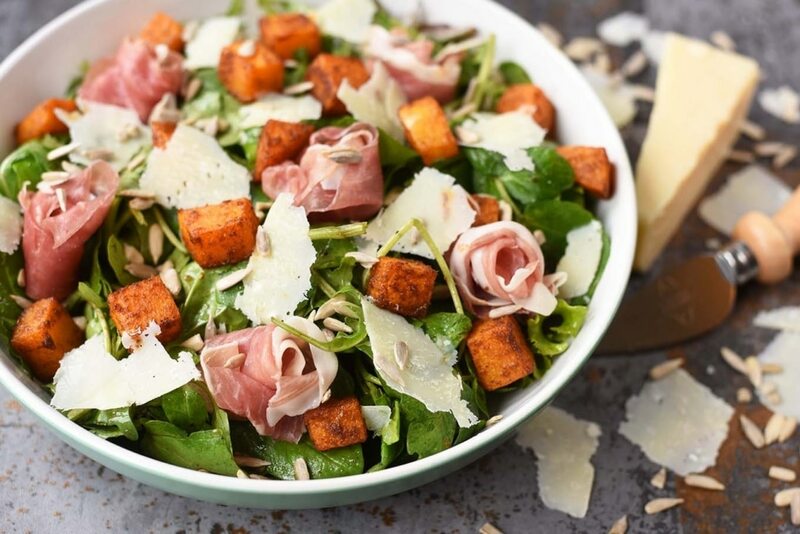 This Roasted Butternut Squash, Grana Padano and Prosciutto di San Daniele Salad is definitely not just all greens and has some real bite to it and will keep you fuller than most salads. You could make this for lunch, or your could make a big ole’ bowl of it and serve it up as a side dish at a BBQ. I think that salads are usually an afterthought at a BBQ and people just throw a bag of lettuce in to a bowl. Why not wow your BBQ guests with this instead. Creamy butternut squash, crunchy and creamy cheese and salty prosciutto make this salad a serious taste sensation. 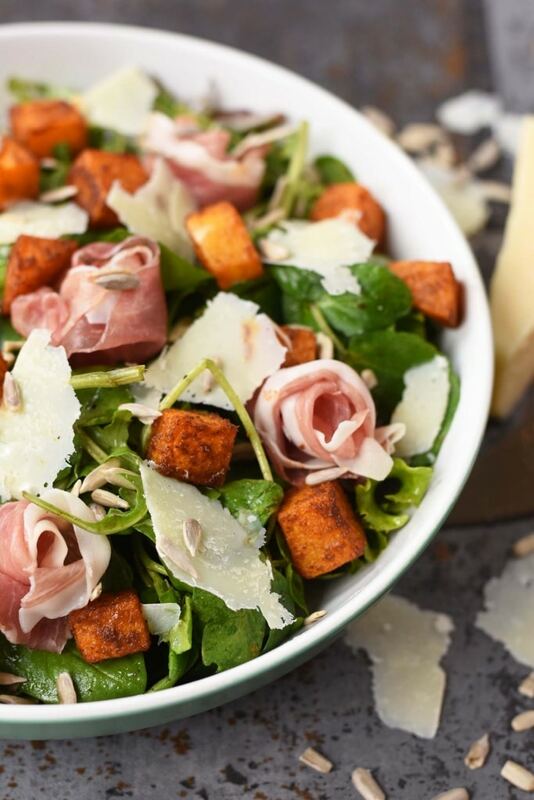 Do you want to be kept up to date on more delicious and healthy recipes like this Roasted Butternut Squash, Grana Padano and Prosciutto di San Daniele Salad? Please subscribe to the blog mailing list (it takes 30 seconds). You will get sent the new recipes straight to your inbox. Your email address won’t be passed on to anyone and you will never be spammed. Click here to sign up. As we find ourselves in that strange time of year where we thought warmer weather was arriving and the sky is like “errrm, no. Not yet!” and throws us a curve ball of one day it is blistering hot and the next day we are considering putting the heating back on. I don’t know about you, but at this time of year I have no idea what to eat. Do I eat salads, do I have a big bowl of soup? Who knows! Seeing as we have been having some glorious sunshine, we have been eating a lot of salads, but as it is still not summer, we have been having some hot ingredients on our salads, which really bridges the gaps between seasons and makes it much more of a filling meal. I am really loving new ways to enjoy butternut squash at the moment and roasting them with lots of herbs and spices is definitely the best way to use it. 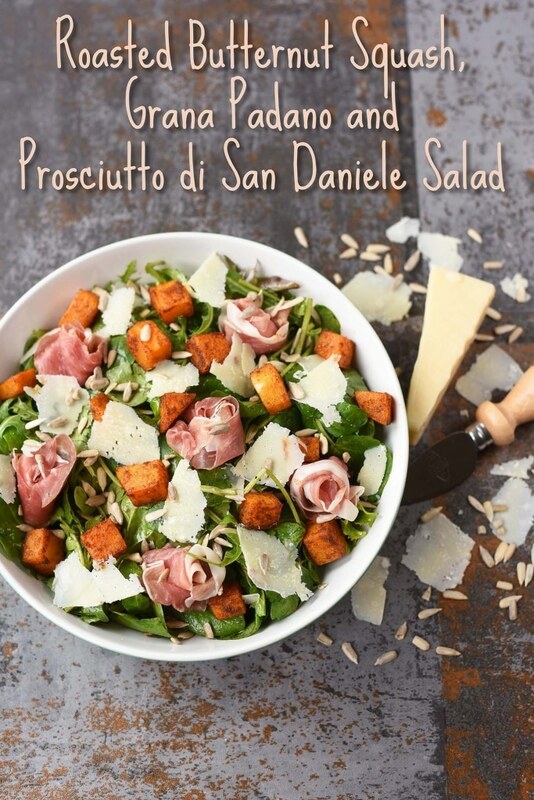 The stars of this salad really are the Grana Padano Cheese and Prosciutto di San Daniele, which are seriously top quality Italian artisan products that will take a salad, or any dish, from bland to grand with no effort at all. Both have been recognised by the European Union as Protected Designation of Origin (PDO) products – in order to achieve PDO status, products must respect the strict Production Specifications and it is reserved for products that are produced using distinctive processing techniques from a defined geographical area. 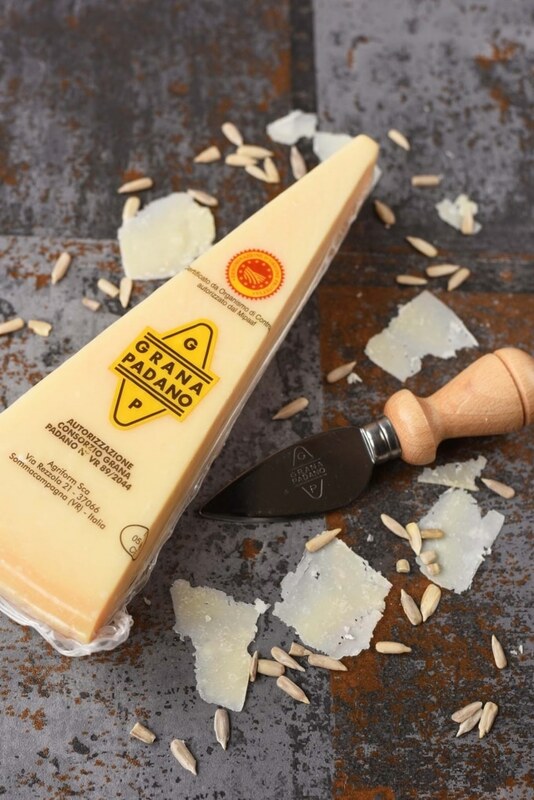 For example, Grana Padano cheese is made from milk from the production area in the “Pianura Padana” (Po River valley in Northern Italy) and can be produced only by authorised dairies. 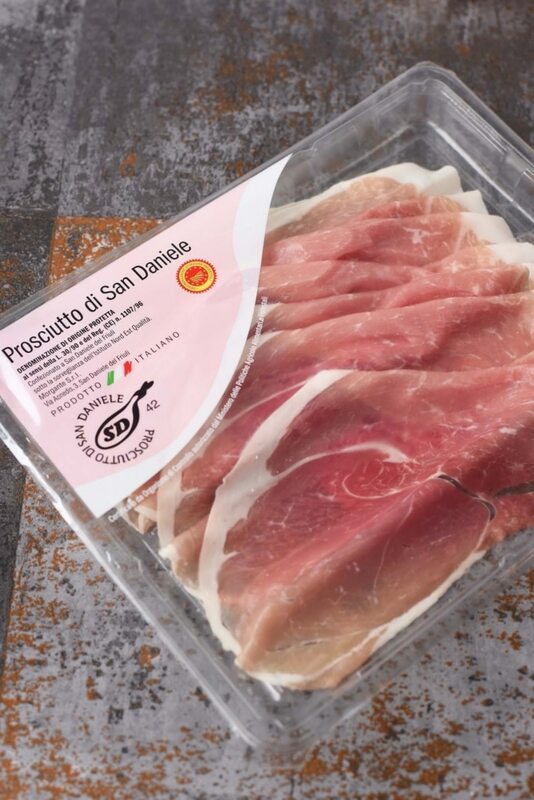 When it comes to the Prosciutto di San Daniele, the same strict regulations are enforced, as only Italian pigs can be used and the whole process takes around 18 months to ensure it has the best flavour. 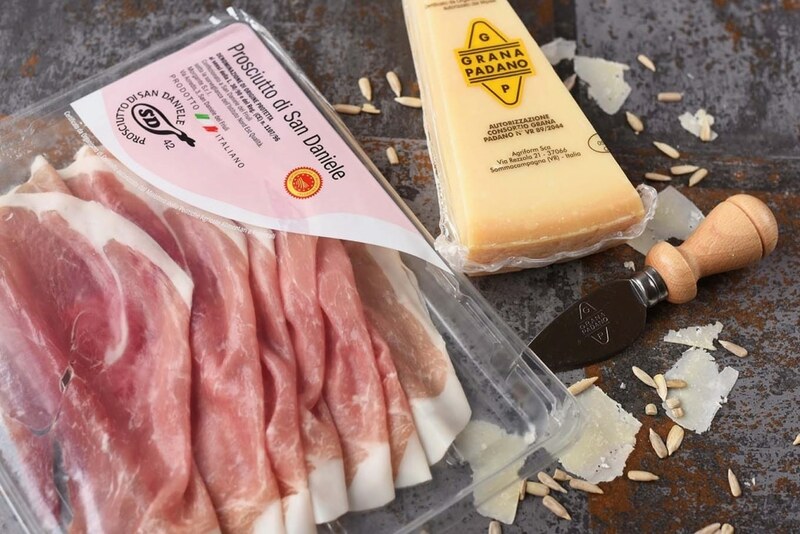 With the PDO logo on the packaging, you know that you are getting authentic and high quality products and that’s exactly what you get with both Grana Padano Cheese and Prosciutto di San Daniele. Grana Padano, which can be used in recipes where Italian hard, aged cheese is required, is a cheese that dates back to the 12th Century. Benedictine monks invented the cheese as a way to preserve surplus milk, and thank goodness they did as it is quickly becoming our favourite cheese. 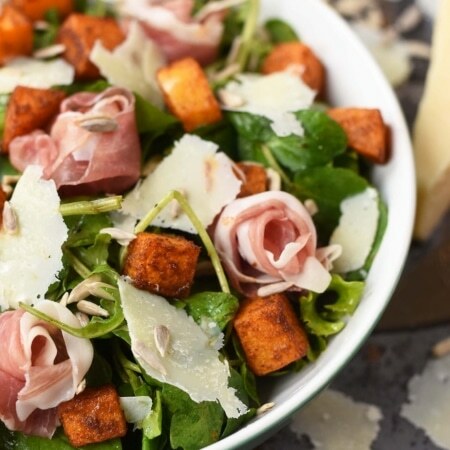 This Roasted Butternut Squash, Grana Padano and Prosciutto di San Daniele Salad is definitely not just all greens and has some real bite to it and will keep you fuller than most salads. Put the butternut squash cubes in a large bowl with the oil and cumin, coriander, paprika, salt and pepper and mix well. Put on a greased baking sheet in a preheated oven at 190C for 25 minutes. Mix the balsamic vinegar with the lemon juice and mustard and mix with the salad greens and divide between two bowls. Top with the cooked butternut squash, Prosciutto di San Daniele and Grana Padano and serve. Take a look at our Avocado, Lime and Tomato Spaghetti and Lemon and Asparagus Pasta recipes, which also uses Grana Padano and Prosciutto di San Daniele. I can’t seem to get enough butternut squash these days – I’ve even started using sheets of it in my lasagna! This looks like a great recipe. I’m not usually a fan of salads however this looks delicous. I’ve never had butternut squash with salads before. Prosciutto is my favorite! This recipe looks so good! This looks incredible! Anything with Prosciutto tastes amazing to me.